It took Joplin, Missouri only thirty-four minutes to lose nearly half of its urban trees during an F-5 tornado that ripped the town apart on May 22, 2011. Nearly a third of the city including homes, businesses, and a major hospital complex were destroyed that night. Century-old trees came crashing down on homes, streets, and miles of power lines, causing further damage and complicating a massive and difficult search-and-rescue effort that lasted more than a week. While working as a volunteer during the clean-up, I was struck by the sight of the trees. Although many were uprooted, thousands stood like ghosts, stripped bare of leaves, branches, and bark by the 200 mph wind. Clearing wind-thrown trees is challenging, even for experienced loggers. There is every kind of stress possible–compression, tension, shear, and torsion–sometimes all in the same log. Root balls return to their upright position with amazing speed once the stem has been cut, and the grit in the logs made short work of a sharp chain. The presence of other volunteers–some of whom had just purchased their first chainsaw for the occasion made the job even more hazardous. Several times, I had a tree roll unexpectedly because someone else decided to work on the same tree without bothering to say anything. Most chainsaw-wielding volunteers wore no safety gear, and some came in shorts and sandals. A coordinator told me that a volunteer had cut himself open with a chainsaw the previous day and required a number of stitches. As I stood in line to get a free tetanus shot, I wondered how many volunteers went to the hospital with a nail embedded in a foot. Those of us with hard hats, chaps, and steel-toe boots tended to work together and let the others figure out how to free their pinched bars–although, tightly wedged in a log was probably the best place for their saws! Trees have emerged as a symbol of hope and renewal in Joplin. Those that survived the tornado are cherished, and many homeowners planted new trees even before the last of the debris of their homes had been cleared away. Pledges for donations of seedlings are coming in from nurseries around the country, but urban forester Jon Skinner is concerned about the future of the trees. “We’re getting all these donations of trees, but most homeowners don’t take care of them,” he says. “And we don’t have the city staff to take care of transplanted trees in the parks. I tell people to let the dust settle and wait until the area has been cleaned up.” Skinner thinks that 2014 will be a good year to replant. Although most people want to see tree-lined streets in Joplin, planning and implementing urban reforestation is a tremendous challenge. Skinner described a few of the issues. “The City Manager is in favor of tree-lined streets, but the City ordinance says that nothing can be planted within ten feet of an underground utility. In most of Joplin, there’s a utility on both sides of the street, so that will restrict 90% of the potential replanting.” To avoid the problems that arise from monocultures, Skinner says he is encouraging a diversity of species on both City and private property. The author winches a post oak log onto the bed of his portable sawmill. The log came from a tree that was salvaged after the 2011 Joplin, MO tornado, and will be used to make furniture for the Elk’s Lodge, which was destroyed. Not all of the wood was buried or ground for mulch. Although most sawmills refuse to take logs from urban areas because of the chance of hitting nails and other objects embedded in the trees, I salvaged as many logs as possible. My sawmill is a Norwood MX34 portable band saw mill. It works well for the variety of sizes and shapes of the logs that come from urban trees–up to 34” (86 cm) in diameter–and the blades are inexpensive and easy to replace when I strike metal in a log. The mill only takes ten minutes to set up, so it is feasible to move it for just a few logs. It is quiet and portable enough that I have even backed it into driveways to saw up a log or two. I even let the homeowners run the mill. With the destruction all around them, I think it gives them an extra measure of satisfaction to participate in the salvage of the lumber that will be made into furniture that they can keep as a piece of their life from before the storm. The author cuts a white oak log from a tree that had died during the summer drought of 2012. The mill handles a variety of sizes and shapes of logs, which makes it particularly useful in salvage and urban lumber. The rewards of running a small sawmill are more than worth the effort it takes to meet the challenges. Century-old oak, maple, and walnut trees produce amazing lumber. But even some of the smaller logs have special significance. Six post oak logs came from the Elk’s Lodge where three people died in the tornado. I donated the boards to a Joplin high school where students will make furniture to go into the new Elk’s Lodge. Even though post oak makes very poor lumber, the furniture will, no doubt, be as highly valued as any made from exotic wood from Africa or South America. One of the best information sources for sawmilling is the Arboristsite forum. 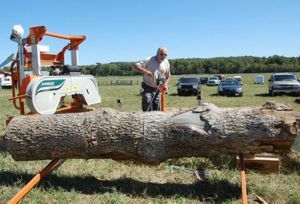 Forum topics cover the range of tree care issues, including sawmills. The people who post on the forum express opinions, share experiences, and offer encouragement to anyone who logs on. 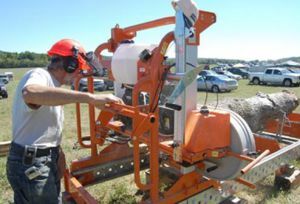 Sawmill & Woodlot Management magazine has a lot of information on equipment, as well as articles on forestry and tree care. Norwood’s Town Hall forum is also a great source of sawmilling information that is helpful to anyone interested in portable band sawmills. Other forums include Woodweb.com, ForestryForum.com, and Treebuzz.com. Joining these forums is a great way to kick around ideas. If you see postings by Post Oakie, you’ve found me!